National Nurses Day is celebrated annually on May 6th to raise awareness of the important role nurses play in society. It marks the beginning of National Nurses Week, which ends on May 12th, the birthday of Florence Nightingale. 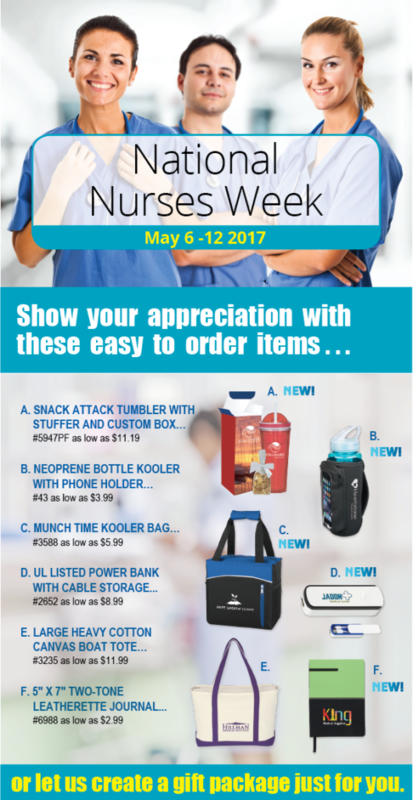 Let Dynamark help you celebrate the nurses in your organization with gifts and awards. Show your appreciation with these easy to order items . . .
*orders placed after April 21st may incur rush charges in order to be received by May 6th. Show your gratitude with a branded Thank-You Card. Give every nurse a certificate of appreciation and hang display banners and posters throughout the office.